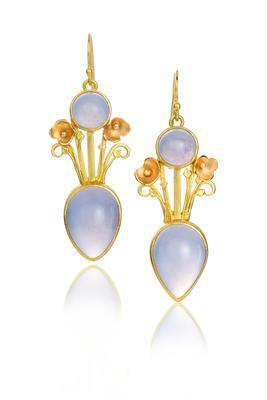 Chalcedony earrings set in 22 karat gold with 18 karat yellow and rose gold, by Guild member Stephani Briggs of Blue Hill. Maine Crafts Guild artisans will once again show their fine craft in wood, metal, fiber, clay, glass and mixed media at the Mount Desert Island Directions Fine Craft Show, July 27 through July 29, at MDI High School. According to a news release, new member Erica Moody of Waldoboro will exhibit her kitchen wares and tools, created with traditional metalworking and jewelry techniques, alongside the Guild’s established member artisans. Guild artisan and jeweler Stephani Briggs of Blue Hill will exhibit her refined jewelry designs, handcrafted in gold and hand-selected gemstones. A luxury jeweler, Briggs creates one-of-a-kind and bespoke pieces with time-honored techniques and hand-brushed finishing. The show will run Friday, July 27, 5-8 p.m.; Saturday, July 28, 10 a.m. to 5 p.m.; and Sunday, July 29, 10 a.m. to 4 p.m. MDI High School is located at 1081 Eagle Lake Road in Bar Harbor. For more information, email mdi.show@mainecraftsguild.com, call 401-935-6704, or visit mainecraftsguild.com.